Want Energy? Consume Plant Food Enzymes….through JUICING & Living Foods! The key to vitality is simple: it lies within enzymes! The difference between live, living, sun-baked foods and cooked, devitalized foods is the presence or lack of — enzymes. It is known that cooking foods, even placing them in boiling water, virtually kills all enzymes. Baking bread kills enzymes. Most dairy products don’t have enzymes. However, if you read a label of cheese at the grocery store, it will say enzymes. These are not the enzymes we are talking about. This reference to enzymes is the cow intestine used to help coagulate and form the cheese. Most dairy products don’t have any natural enzymes, because most dairy products are pasteurized. Juices sold in cartons, cans and bottles may have some vitamins and minerals, but you can be assured the enzymes are long gone. A diet comprised of all (or mostly) cooked devitalized foods deprives the body of the enzyme nutrition it needs to properly function day in and day out. It is surprising – even alarming – that more people do not understand this basic biological fact. Human enzymes are catalysts and, in that role, are key to the workings of the entire body. Enzyme activity begins from the moment an egg is fertilized by sperm, and it does not stop until the day we die. Enzymes initiate, direct or accelerate virtually every chemical reaction required for life. Absolutely nothing happens without enzymes. Breathing, blinking, hearing, smelling, seeing – all are governed by catalytic enzyme activity. Enzymes are required to eat, digest and absorb all nutrients. The immune system depends on enzymes to direct its functions. Enzymes are used by the heart, liver, kidneys and lungs. Indeed, if it were not for enzymes, your body would be no more than a lifeless pile of chemicals. In addition to enzymes, vegetables and fruits contribute much-needed fiber to our body. When food is eaten in a living and unprocessed state, its fibers act as an intestinal broom to maintain intestinal cleanliness. High-heat cooking destroys the fibrous life in food. The fibers lose their magnetism through the heating process and become devitalized. They now act more like a mop than a broom, swabbing through the intestines, all too often leaving a coating of slime on intestinal walls. In time, this slime accumulates and putrefies, ultimately causing toxemia. The colon then becomes sluggish, causing constipation, colitis, diverticulosis and other disturbances to occur. For those of you who have colon trouble or challenges, we suggest a thirty-day colon cleanse. Cleanses can really help with better absorption of the foods you eat. You may want to speak with your doctor before starting any kind of fast or deep cleanse. Linda and I have a naturopathic doctor we always use to help us with cleanses because he can regulate when we should end them or continue with them. To date, science has identified roughly 3,200 enzymes – and that is likely just the tip of the iceberg. One enzyme helps to build phosphorus in bone. Another causes muscles to contract. Yet another is responsible for the clotting mechanism in blood. Fear, hunger and sexual arousal are all controlled in the brain by other powerful enzymes. Undeniably, the importance of enzymes is enormous, for enzymes embody the mysterious “life principle,” the very energy upon which every living thing thrives. This is why we speak of Live Foods Live Bodies. When we consume mostly living foods, our bodies are more alive and thoroughly bathed with living enzymes. We are all born with a fixed amount of enzymes, a kind of personal enzyme bank account. Those who exist on an enzyme-less diet of cooked, denatured, processed foods wantonly spend their body’s precious enzyme reserves. On the other hand, those who regularly consume fresh juices and living juices – which are loaded with enzymes– make regular deposits into their body’s enzyme bank account, and thereby avoid unnecessary disease and premature aging. 1. Enzymes, present in all living foods, are routinely destroyed by cooking anything over 119 degrees Fahrenheit. 2. A diet of cooked, refined, enzyme-less foods forces the pancreas to work overtime, cranking out extra enzymes in order to process the denatured and devitalized foods and move it through the digestive tract. 3. This overburdening of the pancreas causes it to become enlarged, just as an overburdened heart muscle enlarges. This results in accelerated aging, an increase in chronic degenerative diseases, and ultimately cancer. When the pancreas is overburdened with regular consumption of enzyme-less food, it is deterred from its function of producing insulin and creating pancreatic enzymes to keep tropoblastic (precancerous) cells at bay. The pancreatic enzymes devour weakened, ailing, even cancerous cells which left unchecked may result in all sorts of insidious digestive ailments, such as leaky gut syndrome and colitis. You see, all natural foods consumed raw are bursting with enzymes required for their digestion. These food enzymes aren’t lazy. They work day and night to break down and digest the millions of cells in the plants we eat, whether they are fruits, vegetables or herbs. Fresh pineapple, for example, contains the powerful enzyme bromelain; bananas have the enzyme amylase; and papaya, the enzyme papain. Likewise, when you eat a raw carrot, the natural occurring enzyme it contains does much of the work, breaking that carrot down in your stomach and small intestine. But juice that carrot and you “do your body good.” Freshly prepared juices are essentially predigested food, with nearly all the nutrients – and live enzymes – synergistically intact. Juice a carrot, and you give your body an automatic “enzyme boost,” an extra shot of live, usable enzymes ready to go to work for all your vital organs and tissues. This is why we recommend you consume the Digestive Juice Specials (in Chapter One) with your meals. 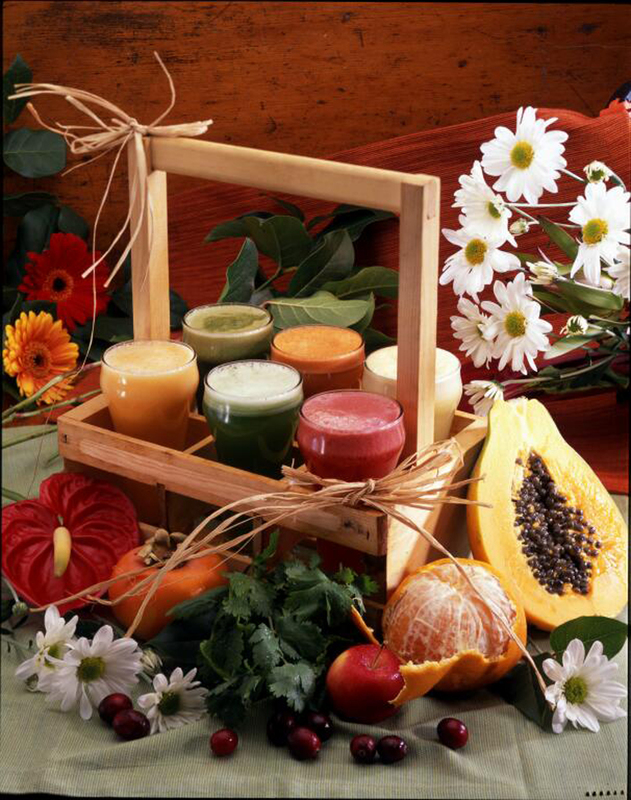 These juices are rich in enzymes, and if by chance you are eating a meal that is not at least 75% living, these juices are designed to help digest your cooked meal. This simply means how much raw food in on my plate? This awareness will ultimately change the way you look and feel about foods forever. 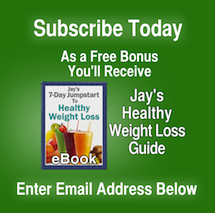 Your personal lifestyle and higher-attuned consciousness will determine how far and how quickly you can go with this eating program. Those living in a warm climate year-round or a more sublime manner of living may find it easier to adapt readily to a new eating routine, while those who are used to fast food, heavy coffee/alcohol consumption and an on-the-go mentality may need to make more moderate changes. Ironically, when we do consume at least 75% of our foods from live plant life, nuts, seeds, herbs and soaked grains, our lives become much more relaxed and balanced. For those who are not consuming at least 75% of their foods in this way, we suggest you consume up to one quart of vegetable juices daily or supplement your diet with enzymes with each meal, but sip sip sip….mix it in with your meal and only drink 8 ounces, nothing more, otherwise you will dilute your stomach acids. You can also add to your cooked meal one of the following: chopped raw onions, chives, or uncooked fresh garlic. Adding these items to cooked food helps to make them more “alive” with available natural enzymes for better digestion. We believe the compounds in raw onions and garlic destroy foreign bacteria. Raw onions and garlic contain a natural antiseptic that also helps keep the colon clean. 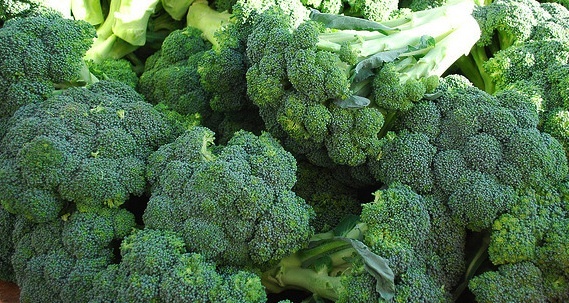 Researchers Victoria Kirsh, Ph.D., of Cancer Care Ontario in Toronto and her colleagues investigated a possible connection between consuming more cruciferous vegetables, specifically broccoli, and cancer risk overall. Their results indicated a larger intake of dark green and cruciferous vegetables, especially broccoli, was associated with decreased risk of aggressive prostate cancer. To make the most of your fresh broccoli purchases, use the florets in your salads and use the stalk in your juice. A great recipe is a few carrots, an apple, 1/4 to 1/2 stalk broccoli and a stalk of celery. National Cancer Research study article here. New research indicates blueberries, strawberries and acai berries may activate the brain’s natural “housekeeper” mechanism and help rid the body of toxins linked to age-related memory loss and other types of mental decline. The research was done at the U.S. Department of Agriculture-Agricultural Research Service (USDA-ARS) Human Nutrition Research Center on Aging in Boston. The results suggest that “natural compounds called polyphenolics found in fruits, vegetables and nuts have an antioxidant and anti-inflammatory effect that may protect against age-associated decline,” said researcher Shibu Poulose, Ph.D.
Walnuts were also indicated in the research to have similar anti-aging effects. 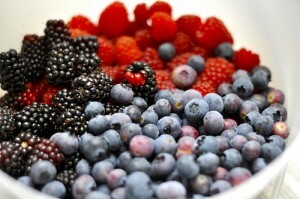 So add a handful of berries to your daily juice combos and replace packaged processed snacks with a handful of walnuts. 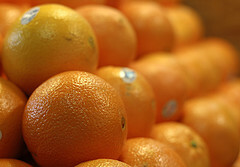 We all know about the Vitamin C in oranges, but what else makes the orange such a powerhouse of nutritional benefits? Researchers wanted to study if the whole is more important than the parts as far as this tasty fruit is concerned. What the researchers found was nothing new to those of us who have been listening to Jay Kordich for many years. Their conclusion is basically the same thing Jay has been saying for years. The whole orange is more important than it’s individual parts. It’s the synergy of all the minerals, vitamins, anti-oxidents, phytonutrients that make the orange so useful to the human body. Squeezing maximum health benefits out of an orange. New research suggests drinking beet juice increases blood flow to the brain. This indicates beets may help fight the progression of dementia in older people. Researchers are centering in on the high nitrate level in beets, also found in other green leafy vegetables, because nitrates open up blood vessels and this may be the reason for the increased brain blood flow. Previous studies have shown drinking beet juice can lower blood pressure. 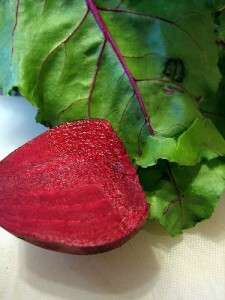 This new study looked at the areas of the brain that may be affected by the beet effect. Their results indicated “increased blood flow to the white matter of the frontal lobes, which are the areas of the brain most commonly associated with the degeneration that leads to dementia and other cognitive conditions”. 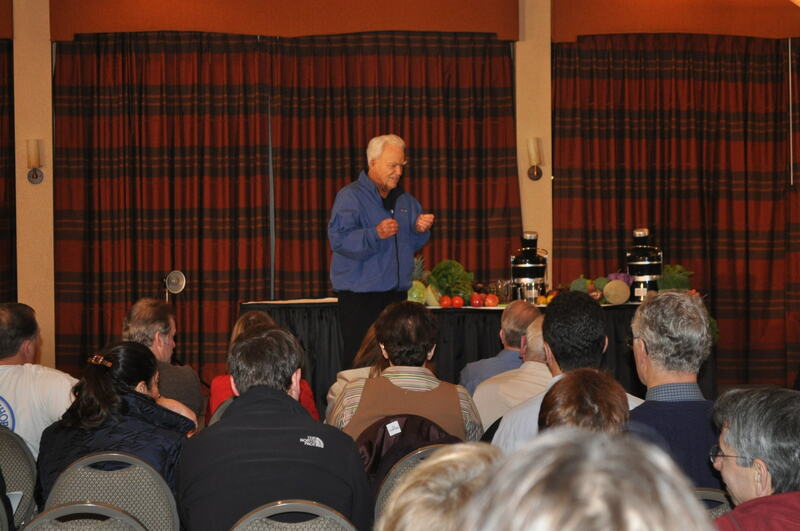 Jay suggests adding beets to just about any of your vegetable juice recipes. However he cautions you to start with adding just a 1/4 of a beet to your juice combo and then increasing this daily until your body becomes accustomed to them. Recent Research indicates using this substance on a daily basis, three times a day if you feel like it, can help you lose about 2 pounds of weight per month. That magic elixir, drum roll please . . . . it’s water. Seems like on a daily basis recently we read about another reason to question manufactured and corporately created, grown or raised food products. The latest nail in the coffin is research that shows tea, you know, the stuff everyone and their brother tells us is good to drink, turns out not so much the case if it’s commercially made and bottled. You need to brew it yourself to get the healthful benefits. Surprise! 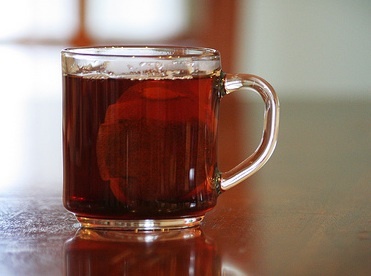 Homemade tea has 20 times the antioxidant of bottled tea.